ASA/USA Complex of the Year 2014 ! Arrowhead Park in Broken Arrow, Okla.
OKLAHOMA CITY —After hosting two ASA/USA National Championships this year, including the inaugural 2014 ASA/USA Girl’s 16U Gold National Championship, Arrowhead Park in Broken Arrow, Okla. has been selected as the 2014 Amateur Softball Association (ASA) of America/USA Softball Complex of the Year presented by Stabilizer Solutions, Inc. Announced today by ASA/USA Softball, Arrowhead Park will receive their award at the 83rd ASA/USA Annual Meeting in Reno, Nev. and will also receive approximately $2,000 in field maintenance products from Stabilizer Solutions. Previous award winners include the Charlie McVay Complex (Roswell, N.M.) in 2013, the Botetourt Sports Complex (Botetourt County, Va.) in 2012, the James I. Moyer Sports Complex (Salem, Va.) in 2011, Veterans Park and Athletic Complex (College Station, Texas) in 2010, Heritage Park Softball Complex (St. Joseph, Mo.) 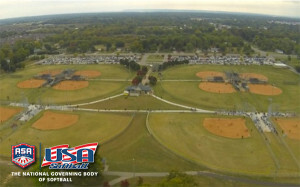 in 2009, Twin Creeks Softball Complex (Woodstock, Ga.) in 2008 and Freedom Ridge Park Complex (Ridgeland, Miss.) in 2007. The Field of Dreams Complex (Las Cruces, N.M.) won the inaugural 2006 award. Built in 1995 as an eight-field complex, Arrowhead Park underwent a renovation in 2013 that included the addition of four fields to bring their total to 12. Staffed and operated by the Broken Arrow Girls Softball League, the complex sits of 30 acres and features a walking trail and park just outside the fields. Inside the ballpark, each field offers covered spectator seating, covered dugouts for the athletes and coaches, digital scoreboards and a PA system. In addition to the covered seating, the complex features two gazebos at each grouping of fields for spectators to watch the action on four different fields. Fans also have access to free wireless internet at the complex. Most recently, Arrowhead Park hosted the inaugural ASA/USA Girls’ 16U Gold National Championship, which was held July 21-26. Eight of the fields were utilized for game play while the remaining four fields were dedicated solely as warm up areas for teams. All fields of play offered free online stats during the weeklong National Championship, while Field 1 offered free live streaming. 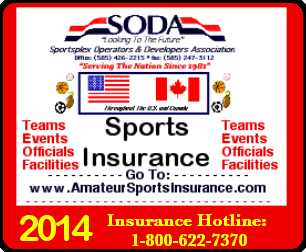 Arrowhead Park also held the ASA/USA Girls’ 18U Class A Southern National Championship July 13-19. Sports Facility Operations: Automated and Streamlined ! As I train sports facility owners and managers on how to set up their businesses with eSoft Planner online scheduling software, they often tell me specifically how their facility operates and expect the system to conform to their operations exactly. In reality, you’re not likely to find a system that can replicate your operations in every way. Some flexibility is required when you’re automating your operations with a software program. This automation always saves time and money in the long run compared to scheduling by hand or using an Excel spreadsheet, so it’s definitely worth making a few tweaks – either to the software or to the systems in place at your sports facility. In fact, existing facilities that are starting to use a new software program have a good opportunity to re-evaluate operational practices. Keep in mind that most sports facility scheduling software is built to accommodate the operations at a majority of sports facilities. If your own scheduling practices deviate wildly from the norm, it’s worth considering the benefits of the alternatives that are presented to you, especially because it’s difficult to change your software once it’s already been set up. However, if your software system can’t do something that you’ve determined is important to your clients and your bottom line, there are usually minor workarounds that can be achieved. Software systems and sports facilities may use different language to descripbe the similar services and operations. When setting up your facility software, everything boils down to how and when you require your clients to pay for their services. One recent client balked at the restrictions because his facility had defined “sessions” that started on the same date each month for everyone and had a pre-determined number of classes in each. Since eSoft Planner’s “memberships” can start on any day of the month, he wasn’t sure the software was a good fit. However, we quickly determined that clients starting mid-session could just purchase the remaining lessons in the session as “classes.” They could purchase a “package” if they just wanted to pay for one month, and if they wanted to auto enroll in future sessions, a “membership” would work. Remember to be open minded and work with your software provider to come up with the bests solution for your sports facility. If you have any questions about how you can make scheduling at your facility more efficient, I’d be happy to set up a consultation session with you.